DETROIT RUNNER....: Do you agree with McMillan? 4 miles on the schedule today.....done! So, I have been thinking more and more about my marathon time. As most of you know, I am hoping to break the 4 hour mark with my second marathon. Personally, I think I'm a pretty good half marathoner. My last race I ran a 1:39:18; really fast for me although I think I probably had a tad more left in the tank. It was just my day! Today, I went on the McMillan calculator. If you have not seen it, click HERE to go to it. Basically, you put your time in for a previous race at another distance and it will predict your other distances. I believe the predictor's for the marathon would be more accurate given a time used for a half marathon vs. a 5k but who knows. I have not researched it THAT much! According to the calculator, my time for a marathon(which is what I've trained for) is predicted to be 3:29:35. NO FLIPPIN' WAY! Sorry, but I just don't see that happening. In fact, I won't even try to do the race that fast. I already know that if I start out at an 8 minute pace, I will crash and burn at the end. While I am confident I will do well at my next race, I believe this predictor time to be very unrealistic. Can I get there someday? I think so but it's going to be several years to shave off that much time. Question of the day? Put your numbers in, do you agree with what you see? No matter the race or the predictor, McMillan has never been close for me. I just put in my most recent half marathon time and it predicted my 15K time as 1:49, I did a 15K a few weeks ago and it was 1:47 so that's pretty darn close. It shows my full marathon time would be 5:37 - I was figuring on 6 hours, so that might be a bit fast. I did my half marathon fast (for me), not sure I could hold that pace for a full. OK I often look at the McMillan calculor and other such tools, and yes they aren't bad at all, and all my PR are more or less in line. All that said I trained like a demond, 7 days a week, up to 100 miles a week running twice a day 3 days a week ect... 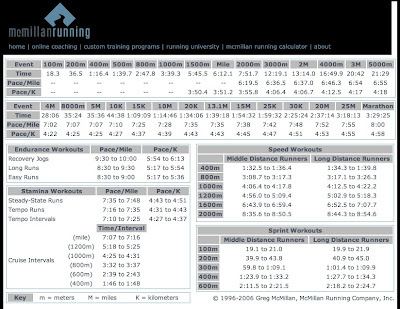 So I think if you really wanted to convert that half into your 3h30 marathon you are going to have to run 60 miles a week with 2 or 3 sessions. Things like 8 x 1000m / 800m or Hills reps 15 x 60 sec, how about a race pace run of 15 miles on the Saturday and then 18 miles on Sunday. Maybe training that hard will put you over the top (getting injured) or take you to that sub 90 half and a 3h15 marathon!!! It predicts a 3:47 marathon time for me, which is kind of a stretch, but I'm aiming for a 3:50, so it's pretty close. Heck no. I can not come even close to the "predicted" number. Regardless, it's just a number and we are human. You never really know what you are capable of until it happens. The McMillan has been pretty accurate for me in the shorter distances... up to a Half marathon. The Marathon prediction time was super insane fast, like you said No Flippin' Way! Using my best half time, it says I should be able to run a 3:25:40. Its close. My last marathon time was 3:28:59. I will not be shooting for this on the 16th though. I am running with a friend and refuse to leave him behind. :-) His goal is 3:40-3:45 so I am going to make sure he achieves that time! LOL, that second 13.1 is the part that gets you! There are so many variables involved. You also have to look at his training paces as well, it's more than just putting a number into the calculator. I've heard that the marathon predictor is only accurate for those who can finish faster than 3:30. I've found that the mile to 5K is almost spot-on, but the 5K to half comes out a little fast, then half to full marathon is very fast. A better predictor is to take your half time and multiply by 2.2.